Boultbee cottages almshouses Emery Down. Work to transform historic almshouses in Emery Down near Lyndhurst has received a Royal seal of approval. The 140-year-old Victorian Boultbee Cottages have been given a prestigious award by the Prince of Wales after undergoing a £600,000 restoration programme. The Trustees of the Grade II listed almshouses worked closely with planners and building conservation experts at the New Forest National Park Authority to ensure the buildings were brought up to modern standards but maintained the traditional character of the buildings. Almshouses provide affordable housing for the vulnerable or needy and are run by local charitable trusts. 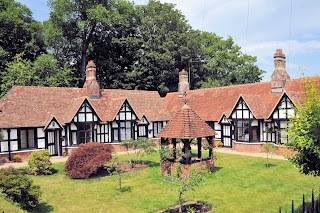 The Emery Down Almshouses Trust has spent over five years raising the funds to restore and extend the five cottages which had become uninhabitable. Jan Smart, Chairman of the trustees, said: ‘This is an unexpected honour and marks the completion of a long and frequently-daunting project. Emery Down is a very small village and without local support the plan to restore and extend the Almshouses would never have been attempted. The renovated cottages are a source of pride and the homes they provide are a joy to their tenants. Prince Charles is the patron of the Almshouses Association and gave his Patron’s Award to the Emery Down scheme, one of only two awarded this year. The awards celebrate excellence in architectural and living standards and recognise outstanding projects and developments. The trustees are hoping the Prince will visit the Grade II listed cottages to present the plaque personally. Much of the restoration cash came from the Almshouses Association, the Homes and Communities Agency and local donations. The Trust has had to take out a £240,000 mortgage to cover the rest of the cost and the trustees are appealing for donations. They can be sent to: Clerk to the Trustees Roger Riley, Home Farm, Emery Down, Lyndhurst, SO43 7FH. Today there are around 1,800 almshouse charities. They provide 31,000 almshouses in the United Kingdom accommodating around 36,000 people. Admiral Boultbee died in November 23rd 1876 and is buried in Christ Church, Emery Down.